North Carolina Halloween Attractions are some of the biggest and best in America! Halloween Attractions rates and review the best pumpkin patches, corn mazes, haunted attractions, and Halloween evnets in America! Kersey Valley located in Greensboro, North Carolina near Charlotte, and Winston Salem, NC, has one of the biggest Halloween events in the country! Now prepare to read our entire review and take a trip back and learn the history of Kersey Valley. Spookywoods a haunted house in North Carolina is more than just a haunted house attraction, during Halloween they have hayrides, zip lines, laser tag, pumpkin patches and so much more. 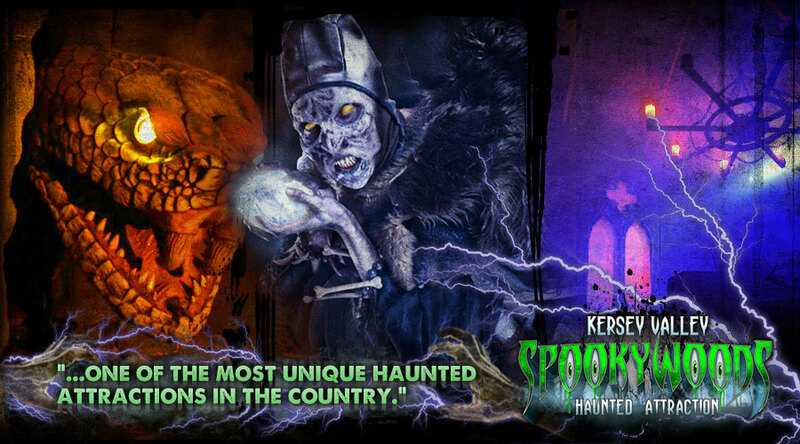 This attraction is the complete Halloween Screampark for the entire family from small children by day with corn mazes, dino digs, hayrides and zip lines to a the hands down scariest and best haunted attractino in North Carolina. Spookywoods is a short drive from every major city in North Carolina including Winston Salem, Charlotte, and Greensboro. Now Prepare to have the fright of your life with our complete review of Kersey Valley! Kersey Valley Attractions is centrally-located in Archdale, North Carolina. Tony Wohlgemuth, founder of Kersey Valley Inc., was nine years old when his family moved to the 60 acre farm in 1979. Purposed as a Christmas tree farm, the property had several tobacco barns, a farm house and main residence. The farm was a popular place to spend summers camping in the barns. Tony and friends pulled power from the farm house by drop cord to one of the tobacco barns. Just after midnight on a hot summer night a chandelier fell, stopping just inches from the boys lying in sleeping bags underneath it. The end of the drop cord was caught by the window seal keeping the heavy iron light fixture inches away from hitting the boys. The frightening occurrence spawned a dare between friends to enter the old house and restore the power, insisting someone must go upstairs to satisfy the dare. One of the boys entered the house alone only to return moments later screaming that something was on his back. He managed to scare up a family of bats, one landing on his back. The incident shook the group of boys to the bone, creating an idea for a five room haunted house in the fall of 1985. The House of Death came alive that year the last two weeks of October selling just over 1,000 tickets at $2 each. Marketing efforts were limited to hand-drawn flyers given out at the boys’ high school. By the 4th year, popularity for the attraction meant a 4 hour wait in line. Tony knew it was time for a change and expanded the attraction with a walking trail in the woods. When Tony met his wife, Donna, in college; she encouraged him to focus on his degree and career. It became clear that a passion for the haunted attraction was undeniable. Donna joined Tony to build the haunt and operate the attraction as a business. Incredible growth followed. The haunt was expanded further, creating a unique pathway through a dense forest of (Christmas) trees. The name was changed to Kersey Valley haunted House & Forest the following year. Each group of 8 guests was guided through the attraction, limiting throughput to 125 people per hour. The next hurdle was increasing the throughput of the attraction to increase revenue. Tony and Donna attended the 1996 IAAPA Conference and gained newfound knowledge of an unguided concept. The entire (Christmas) tree area was redesigned, transforming rows of trees into areas that could accommodate walls and scenes to fit under the canopy of trees. The haunt was very spooky and the business was transformed into an unguided format. The same year a domain name was sought out for the website and www.spookywoods.com was the perfect fit! The new format reduced the wait to an hour or less and the throughput increased to over 800 people per hour. The additional income generated from the dramatic increase allowed a much larger budget for improvements to the attraction. As the haunt continued to gain popularity, Tony and Donna planned to expand their seasonal business while both still worked full time. 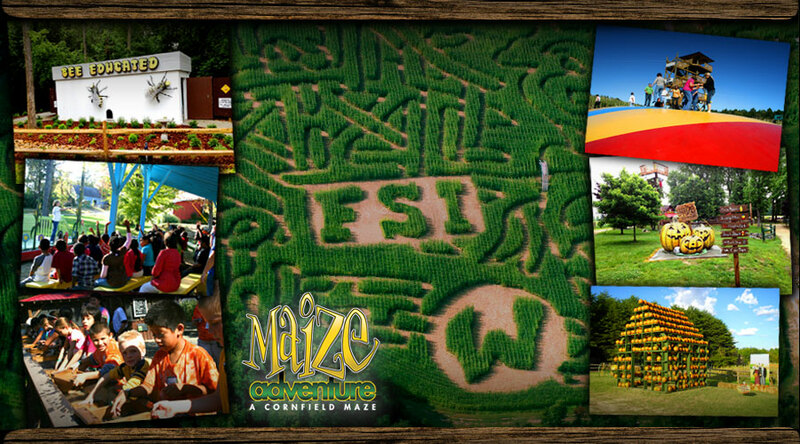 Tony suggested that a corn maze would be a great use of the 10-acres of farm land around the haunt and Maize Adventure was born marking the beginning of day time attraction offerings. Trial and error lead them to Maze Play in Idaho that offered the technology required to design and cut out the maze using GPS. Donna began researching day time field trip opportunities for school children. The marketing was sent to schools within a 50 mile radius. Those efforts began to pay off and soon the day time business was packing the farm with kids during the weekdays. The focus shifted to expansion of the day time business to keep schools coming back each year. Gem panning was discovered while on vacation in Tennessee. A vendor that creates gem panning attractions was found at the next IAAPA conference. A company from Canada was hired to build the attraction, expanding the educational opportunities to schools with an educational event on gems and fossils. An outdoor classroom was designed providing more educational experiences for students such as Planting Seeds of Knowledge and Bee-Educated field trips. As Maize Adventure gained popularity additional features were added, including a giant jumping air pillow. The jumping pillow was installed and became an instant hit with children. The first pillow has just recently been replaced with two of the giant 40x70 pillows to reduce wait times for children to jump. 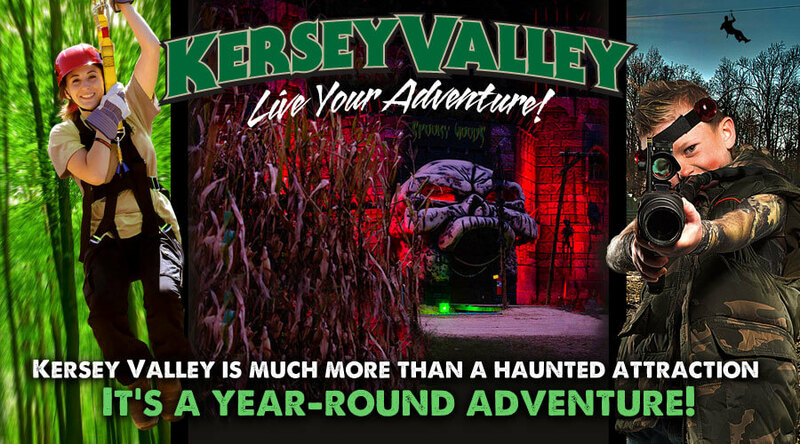 The Kersey Valley brand came alive when multiple attractions with distinct demographics were fully operational. The portal site www.kerseyvalley.com was created to cross promote all events and attractions. Each attraction and event maintains its own website also. 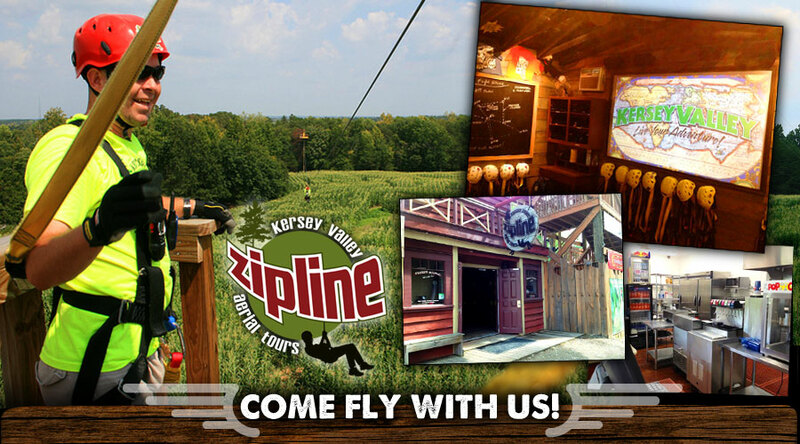 In 2010, Kersey Valley expanded into a year-round business with a 1.5 mile zip line tour across the farm. Kersey Valley reinvented the zip line experience with engineered Sky Towers and best-in-class equipment. The attraction is aviation themed boasting Coach and First Class ticketing options, Flight School, Sky Towers named after airport city codes and Flight Captains as zip line guides. The Sky Towers were strategically placed to enhance cross promotion between attractions. Opening year-round required permanent restroom facilities. Tumbleweed’s, a state-of-the-art kitchen concession facility and restrooms were built. A surprise is harbored in the women’s restroom; as guests approach the sink they activate a loud scream and ghost illusion in the mirror. 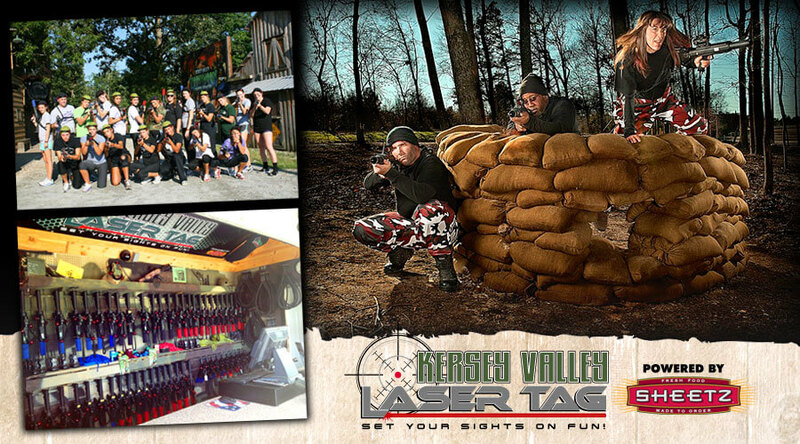 Kersey Valley Laser Tag, an outdoor tactical laser tag attraction, was added to the attraction line-up in 2012. The attraction draws a diverse demographic as the equipment can be programmed for a simple game of shoot and tag to detailed programming for corporate groups with team-building initiatives. Kersey Valley Laser Tag is a great option for birthday parties and bachelor parties looking for a unique celebration experience. The humble beginnings of the haunted attraction business have allowed Kersey Valley to continue expanding and employ year-round staff. Kevin Burger is the Safety Coordinator and managed construction of the massive zip line and restroom and kitchen facility build. Kevin attended the Maize Adventure Corn Maze in 2000 with his church group, fell in love with the farm and never left. Elizabeth Penn is the driving force behind sponsor partnerships with local and national corporate partners. She wears many hats including promotional video coordination and design, special event planning such as Kersey Valley’s Dark Circus and is an integral part of the haunted attraction. Chrissy Hughes is the Office Manager and master of the zip line reservation system. She is the voice of Kersey Valley, answering hundreds of call a week with a smile. Chrissy projects the fun attitude of Kersey Valley! Tom Roever, Scot Edwards, Kevin Burger and Darrel Justice are several master carpenters that comprise the build crew creating the incredible sets at Spookywoods. Steve Lee handles audio and lighting for the haunt. Joh Harp and Amber Michael are the year-round FX team and set designers. RJ Barber is the resident welder that can build anything the team dreams up. Tom Benedict, Tony Forest, Wendy Martin, Ben Medlin, Kathy Justice and Steve Wood keep the haunt running like clockwork. Tony comes up with the fun stuff and Donna keeps a close eye on the budget and pays for the fun stuff. It takes an army of dedicated and talented people to run Kersey Valley. The amazing staff is a result of the passion that Tony and Donna have to create stand out events and attractions; it’s contagious and it shows. The Christmas trees planted in 1980 saved the farm, becoming the backdrop to one of the most unique haunted attractions in the country. Looking ahead, Tony and Donna have a list of dreams from weekend events to an event venue barn, seating 300 guests. If it’s a Kersey Valley event or attraction you’ll be right in the middle of the FUN STUFF!